Takamatsu City is located in Kagawa Prefecture, Shikoku. (Link) After arriving at one of the international airports, you will need to travel to Takamatsu. Japan Railway (JR), highway bus and domestic flight services are available. 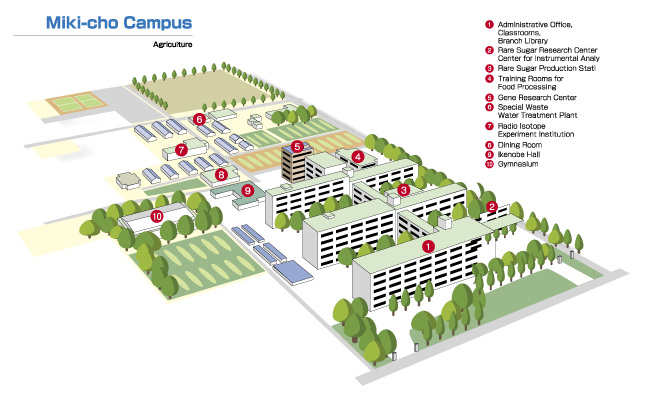 The Faculty of Agriculture Campus is in Miki, Kagawa. Walk directly out of Takamatsu Station and veer slightly to the right. You will see Kotoden Train Staion (Chikko) across the street. Take the Nagao line (the trains are green) and get off at Nogakbumae (this literally means “station in front of the Faculty of Agriculture”). The Faculty of Agriculture is about 200 m up the road.